" I have been a patient of Dr. Heifetz’s for more than 25 years. During that time he has improved my bite and smile with crowns and veneers. But equally important is the preventative and periodontal care I have received from Dr. Heifetz’s hygienist, Maria. 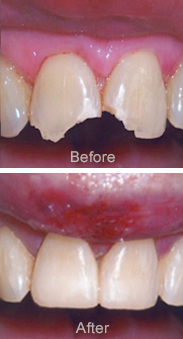 Together, they advised me on the best methods to care for my teeth at home so I can maintain healthy teeth and gums. I feel very good about my oral health and am thankful for their dedication and efforts.
" I manage a dental laboratory in New York City and get to see the work of many of New York’s finest dentists. I had a consultation with Dr. Heifetz in the hope of resolving my severely overcrowded, crooked and discolored teeth which I have always hated. We decided to use invisible aligners and whitening to fix my smile. Although my treatment is not yet complete, people are already astonished at the results thus far. I am thrilled. I used to hide my teeth and smile with my mouth closed. Thanks to Dr. Heifetz I can finally smile confidently.